Yes you can,but I think I found a solution after all. Perhebs you can "update" the bootsector of the USB-stick with "BootSect.exe" to NTLDR (boot.ini),after saving the current with "mkbt.exe". I'm testing at the moment. Do I understand it right,you did make the USB-stick "DOS" bootable with HP utility and put Command.com,IO.sys and MSdos.sys to the USB-stick? Then start "PCMENU" trough "Autoexec.bat? at least on normal bootsectors (I tested wit FAT16, but both FAT32 and NTFS should work), so you can try making a copy of the bootsector, hexedit it and chainload it from grub. Still waiting for Mike69's answer. yes wanderer...thats how ive done it! It's a tool to rewrite the bootsector of the USB-stick. I have to go out for about 2.5 ours,but then i will write a guide for you. For now you can install the Recovery Console on your harddrive,if not done already. Guide to convert FAT32 DOS-bootable USB-stick,to boot "DOS" from Boot.ini including Recovery Console. Make a backup of the USB-stick!! You find BootSect.exe and mkbt.exe in USB_MultiBoot_8\makebt directory. 2.Copy cmd.exe from C:\WINDOWS\system32 to C:\USB_MultiBoot_8\makebt directory for convenience. 3.Make a "files" directory on the USB-stick. 4.Start cmd.exe and run "mkbt.exe -x -c X: X:\files\MSDOS.dat" without the ",where X: is your USB-stick driveletter. 5.Check if MSDOS.dat is in the "files"directory!! 6.If so,make a backup of the "files" directory to your harddrive!! 7.Start cmd.exe and run "bootsect.exe /nt52 X:" ,without the " where X: is your USB-stick driveletter. 8.Start cmd.exe and run "mkbt.exe -x -c X: X:\files\CMLDR.dat" without the ",where X: is your USB-stick driveletter. 10.File > Open and select CLMDR.dat and press Open. 11.Edit > Find/Replace and type "NTLDR" ,without the ",check "Find text" and press Find. 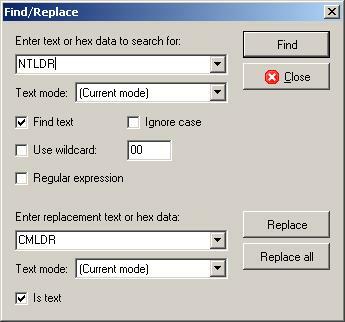 12.Press Replace and type "CMLDR" ,without the ",check "Is text" and press Replace. 13.Close Tiny Hexer and save changes. 14.Copy NTLDR an NTDETECT.COM from C:\ to the USB-stick. 15.Put this boot.ini on the USB-stick. 16.Copy cmdcons directory and cmldr file to the USB-stick. 17.Start the USB-stick and check if all is working OK.
i know im a complete noob but where are the files from step16 ? Maybe you need to reveal\uncover the hidden files? Would it be possible to place here an example of your PCMENU-file,so I can understand one and other better how it works? 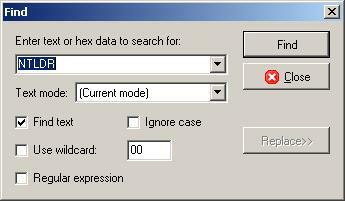 To reverse things run "mkbt.exe -x X:\files\MSDOS.dat X:" where X is the drive letter. Now you should be able to boot from DOS again. I am receving 2 error messages when I atempt to buld this. I have atached 2 screenshots of the error messages. The script(s) you are showing need the nativeEx environment. I assume they do not have. Is there any way to add sata drivers (driverpacks.net) to the recovery console iso?